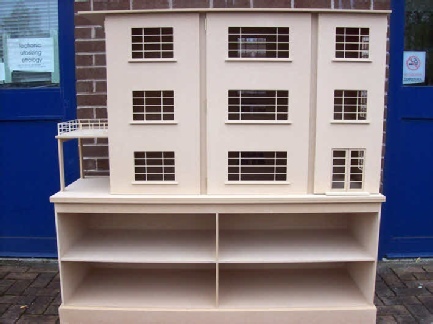 A new addition to our increasing 1:12th Scale range is the Art Deco House. The house has 3 main opening fronts. All floors are pre-grooved ready for electrics to be fitted. All windows have been machined using 3 mm MDF. Art Deco Windows slot into place from the inside allowing you to fit your own 2 mm glazing. French doors are fitted to access the carport balcony. Intricate Art-Deco railings slot into place around the walls above the carport. Each individual window sill simply slots into place in its pre-cut groove. An optional cabinet is available at extra cost. Each component is manufactured using the latest computer controlled CNC routing technology which enables us to work to tolerances of 0.01mm.